We are those few destined to walk the long way and lonesome path! We started from nothing and with our will as our guide became a force to be reckoned with! We celebrate as though it will be for the last time. We who have little, but together achieve much! And when faced with impossible odds and fate lets us down, that is when we find our strength from the Red Flame in our hearts and souls. When we face our fate against all injustices, against all Evil, against all odds, against the arrogance and the tyranny of those that would oppress the sentient of the galaxy, the Red Star shall be our Guiding Light, our beacon of hope. When we fall, or when we are stricken down we will stand up and never shall we give up. Not even with if the last man is standing, for we are One Nation, One Spirit and the Red Star shines brightly upon us! 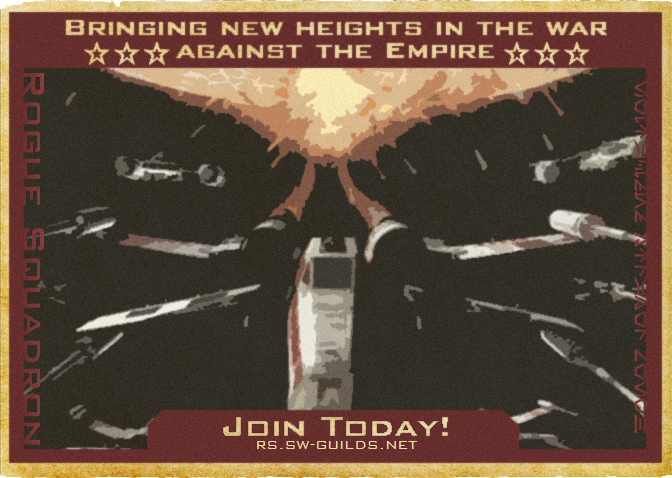 The Rogue Squadron is proudly carrying the fight against the tyranny of the Galactic Empire in the Elrood Sector and elsewhere in the Galaxy. Our resolve and spirit is as unwavering and as high as ever. Our belief is our strength, Our resolve is our weapon, Our determination is Our deliverance. Warning!! !Stormtroopers will be shot, GE Commanders will be shot twice, Guinar Ndengin will be shot repeatedly!! The Fight is coming Soon™ to a system near you!